Be sure to always review your questions and answers before sending out your ballots. Our review system should be able to help with your checklist! Test the ballot, in order to see what your voters will see when they come to vote. You must complete a true test vote (i.e. 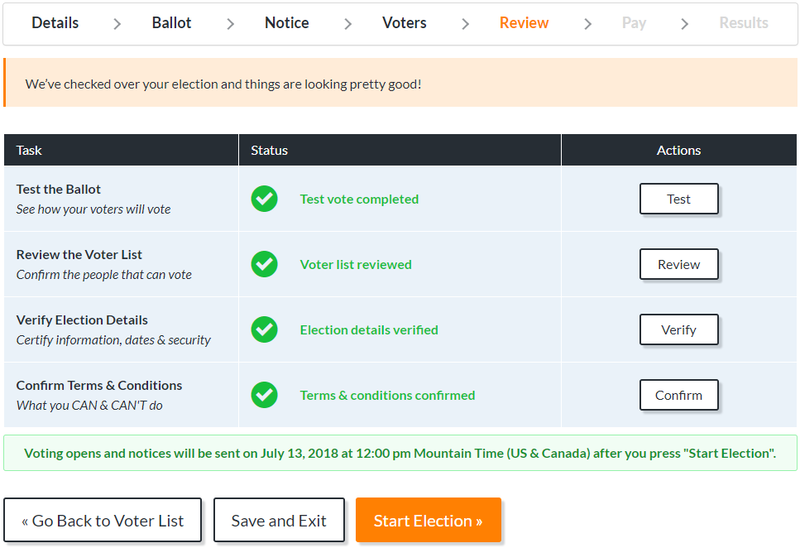 vote like a voter would) to complete this step of the review. This also allows you to review your ballot questions and candidates for each of those questions! Review the voter list, in order to ensure that you've only included members who are eligible to vote, and that no one has been forgotten! Verify the details of your election, including how many reserved voter keys you have for members who join your organization after the election begins. Confirm the terms and conditions, in order to ensure that you're clear on what can and cannot be done with the election after you start it. Please note, that it is VERY IMPORTANT that you plan for members that might join your organization during the election that are eligible to vote. You can pre-plan for as many voters that you think might be needed and include additional voter keys. However, if you don't pre-plan for them, you will only be able to add 5 voter keys for forgotten voters after the election starts.